In stock. Order in the next 2 hours, 12 minutes and it will go out today! 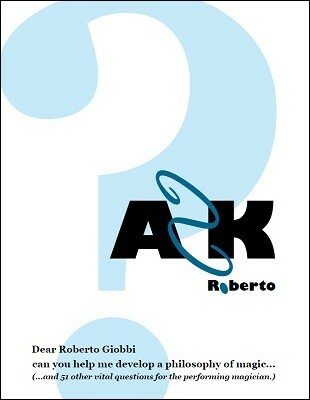 Ask Roberto is a magic book unlike any you have ever read before (by him, or anyone else). The concept is great: Roberto invited 52 fans (via the internet) to submit a question, and he answered all 52 of them. In some cases, he added to or clarified answers later. This is the complete file of those "conversations," and they are wonderful! This gets our highest recommendation. Here we find a more conversational, casual Giobbi, which is quite different than the Giobbi we find in Card College and Secret Agenda. There are deep, insightful questions, like "How do you study?" or "Why do you do magic," and there are very practical questions like "What are the ten best card effects in history?" or "What is your favorite deck switch?" The book is soft-bound and 330 pages, and it ALSO includes bonus essays on "The Too Perfect Theory" by Simon Aronson, Jon Racherbaumer, John Carney, and Jamy Ian Swiss. What do you need to know?? Roberto is the man! Everything he touches is gold including this!